This Is Who We Are – Joining Scotland and Canada in Photographic Conversations » FINDING SCOTLAND IN NOVA SCOTIA. FINDING SCOTLAND IN NOVA SCOTIA. Graeme and I travelled from Glasgow to Halifax to launch the “This Is Who We Are” photography project in the Province of Nova Scotia. We flew with our travel partners Zoom Airlines, Scots-Canadian owned, and the only direct carriers from Scotland to Halifax and onward to Ottawa. This is the fifteenth time I have flown Zoom between Scotland and Canada and the flight was like all the others – on time, comfortable and the crew polite and efficient. Ease of access to Scotland is obviously key to the success of Homecoming 2009 and, as far as Canada is concerned, Zoom is perfectly positioned to provide that. The search for Scotland in Nova Scotia started on the way from the airport as the taxi driver told us about hotels and pubs where the staff wear kilts, Alexander Keith’s brewery, founded by a Scot, and the kilted changing of the guards at the Citadel fort in Halifax. Before long we were sampling Mr Keith’s product while watching Canada lose to Russia in the hockey world championship finals in Quebec City. Halifax had hosted some of the earlier games and we were told later that this partially compensated for abandoning their Commonwealth Games bid, eventually won by Glasgow. 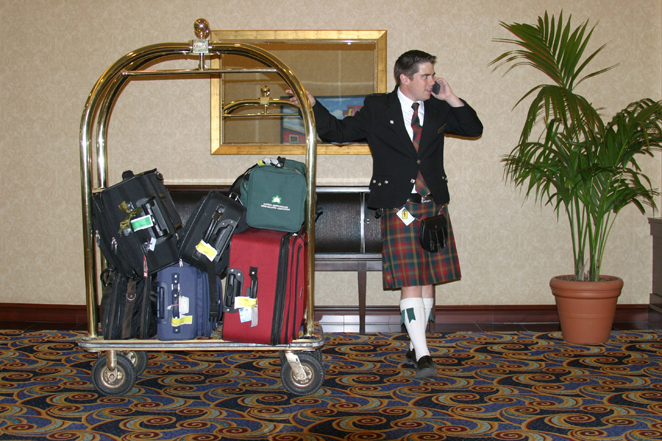 Our first day activities are restricted by the fact that it is the Victoria Day public holiday, but Graeme photographs one of the kilted staff at the Marriot as the first in a series of portraits of people across Canada with Scottish names. His name is Rob Anderson and he is the first of many people in N.S. to tell us of his interest in his Scottish heritage. He says his ancestors came on the Hector which is “Canada’s Mayflower” and the ship that brought Scottish Highlanders (and ten Lowlanders) into Pictou, Nova Scotia in 1773. Canadian Television has been in touch to say that they are “intrigued” by our project and want to film us at Pier 21 tomorrow. Rob Anderson at the Marriot. Pier 21 is where immigrants to Canada used to disembark, including those from Scotland. We had already seen some photographs of Scottish immigrants to Pier 21 courtesy of David Forsyth at the Museum of Scotland in Edinburgh and it is striking how young and full of hope they all look. We film for CTV’s “Live at Five” which has the highest audience rating of any magazine show in the Atlantic Provinces and also goes out on satellite across North America. Our enthusiastic host is Liz Rigney who asks us questions as we stand at Pier 21 and then move around the museum. The piece is broadcast on “Live at Five” at 5.45 and it is very well done. They have me talking about the Scots in Canada and generally about Homecoming 2009 and Graeme on the photography project, the scope of its ambition and how to participate in it. They even show some photographs from some of Graeme’s previous projects. At the end one of the hosts says that the “Scottish” piece has attracted a lot of interest and talks a bit about his own Scottish heritage. We have people stopping us on the street and saying that they saw us on the television. The Chronicle Herald, Nova Scotia’s main newspaper, wants to do an interview on Friday. We drive up to New Glasgow and meet with Kim Dickson who is the Marketing and Communications Director there. Kim not only sets up media interviews for us, but arranges breakfast with the Mayor and even books our accommodation. We go over to the New Glasgow Library and meet with Eric Stackhouse, Chief Librarian, who is very excited about the project and is going to involve the library community in it over the summer. In Pictou we tour the Hector exhibit with Michelle Temple who manages the site and meet Dave Macintosh who is the resident artist there. Dave has his photograph taken by Graeme for the portrait gallery of people with Scottish names. 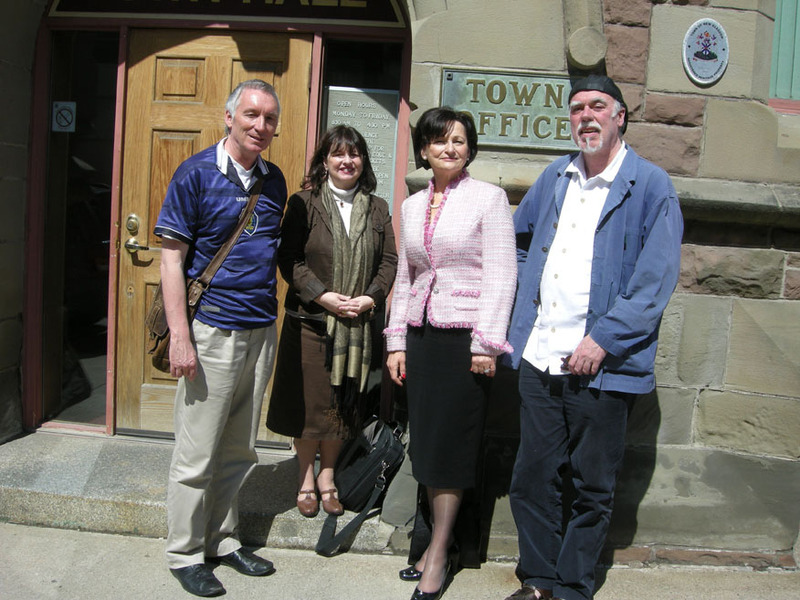 Pictou has recreated itself on the Scottish heritage theme and I am glad that we expanded the same-name towns idea to include “Finding Scotland in…” It would make no sense to exclude places with the remarkable Scottish connections that Pictou has. Lynn MacLean, a retired teacher and local historian whose family came from Glen Uig, takes us around the graveyard in New Glasgow where some of the people who came off the Hector are buried. We go to the local school and speak with teacher Adele Cameron who is going to work with her Grade 5 class on our project. Graeme asks the class “Who has a camera?” and all the hands go up. We drive up to Antigonish to overnight with my friend John McFarland, the retired Athletic Director of St. Francis Xavier University and a legendary figure in these parts. On the drive to Antigonish we pass through Lismore, Knoydart and Arisaig and Graeme photographs the town signs. John loves the project too and will get the university involved and the Strait School Board through the Schools Superintendent, Phonse Gillis. 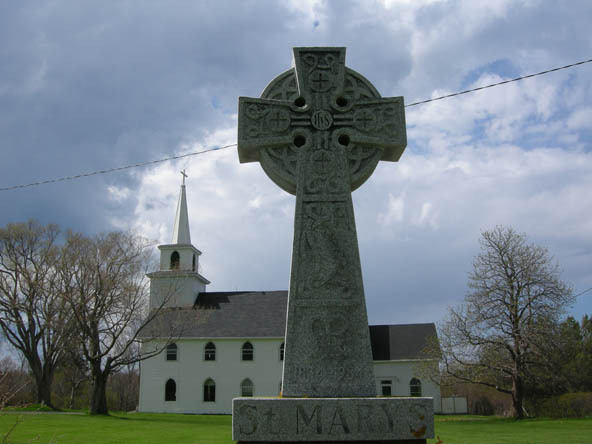 The old wooden church built by Highland Gaels in Lismore, Nova Scotia. From Antigonish, we drive back to Halifax for an interview with Elissa Bernard from the Chronicle Herald which has its offices on Argyle St. We then go to the World Trade and Convention Centre to meet with Barb Steggeman, Manager of Trade Centre Limited. Here “small world Scotland” kicks in. Barb was in charge of Coqutlam Tourism in British Columbia when I was the media spokesman for the British Columbia Highland Games which was one of Coquitlam’s premier events (10,000 attendees). Barb has an idea for a photograph of herself in a “power suit” and several of Canada’s most powerful politicians around her in kilts. She can certainly pull this off as her boyfriend is chief aid to Peter MacKay, Canada’s defence minister. Barb introduces us to Holy Hedd who is in charge at Destination Halifax and Lynn Ledwidge, the Marketing Director at DH. We spend some time discussing how our project could enhance connections between Halifax and Scotland and they agree that this is a consummation devoutly to be wished. From Halifax, we drive all the way to Digby in the Annapolis Valley to stay with Ian Russell who emigrated with his family from the Stirling area four years ago. Digby is close to Annapolis Royal where Sir William Alexander arrived with some Scottish settlers in the early seventeenth centura. Ian has taken on a kind of unofficial ambassadorial role for Scotland since he has been here and done a remarkable job of it. Last year he even had Sir Tom Farmer out from Scotland for a Burns celebration. I was able to give Ian a wee bit of help when he brought a Kings County, N.S. Trade Delegation to Stirling a couple of years ago and he has reciprocated by giving us a lot of help here. We meet Junior Therieault who is the local member of Parliament and breakfast with the Mayor of Digby Frank Macintosh, who duly has his photograph taken for the gallery, and John Demings, the editor of the Digby Courier. Junior tells us that our story and photographs are in the Chronicle Herald that morning and we grab four copies. Very nice back page piece with photograph and plug for Homecoming as well as an explanation of our own project. We return to Glasgow on Zoom (only five hours and fifteen minutes runway to runway), amazed by the response to our project in Nova Scotia. Discounting the weekends and the holiday Monday, we only really had four days to work in, but senior politicians, media people, teachers, hotel staff and waiters, people we met on the street – everyone seemed to have some connection to Scotland and were overwhelmingly supportive of what we are doing with the project. They were also remarkably enthusiastic about the idea of Homecoming and with easy access to Scotland via Zoom, there are rich possibilities here for 2009. Thank you Nova Scotia for your enthusiasm and your hospitality.